Deputy Health Minister Yaakov Litzman has approved a recovery plan for Bikur Cholim Hospital following Jerusalem terror attack. 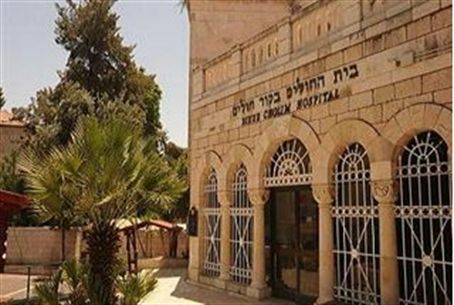 Deputy Health Minister Yaakov Litzman (United Torah Judaism) has approved a recovery plan for Bikur Cholim Hospital in central Jerusalem. Litzman said he would also work to ensure that hospital staff are paid overdue wages by Passover. “One cannot dispute the importance of this hospital's presence in the center of Jeursalem," Litzman said in a meeting with Prime Minister Binyamin Netanyahu. "And of the medical services it provides to hundreds of thousands of residents." The hospital has faced the threat of closure for years. Treasury officials have argued that the hospital, which is privately owned but managed by a non-profit, should not get state money, and that it is unnecessary due to the presence of other large hospitals in the capital, including Shaarei Tzedek, Hadassah Har Hatzofim, and Hadassah Ein Karem. The recent terrorist bombing in Jerusalem undermined arguments against the hospital, and showed that each hospital is critical. Hospital staff pointed out that Bikur Cholim's location allows it to provide rapid assistance in case of attacks in or near the city center. Bikur Cholim faced liquidation in 2007 after falling into almost $50 million in debt. It was saved when it was purchased by Arcady Gaydamak, then a billionaire new immigrant to Israel who was growing increasingly involved in Israeli public life and philanthropy. However, a short time later Gaydamak was facing financial pressures, and announced the loss of large sums of money. In addition, he was convicted by a French court of illegal weapons sales, and faced charges of money laundering in Israel. He left the country for two years, returning only in 2010. A temporary solution was found in January to keep the hospital open.